Founded in 2006, the Future Today Institute helps leaders and their organizations prepare for complex futures. We focus exclusively on how emerging technology and science will disrupt business, transform the workforce and ignite geopolitical change. Our pioneering, data-driven forecasting methodology and tools empower leaders to make better decisions about the future, today. We are living in an era of tremendous uncertainty. Our anxiety stems from information overload and the onslaught of new technologies. A great wave of disruption—anchored in artificial intelligence, automation, robotics, self-driving cars, genomic editing, cognitive computing, the Internet of Things, and big data—is underway. As these technologies move from the fringe to the mainstream, they promise to forever change our companies, economies and social structures. This disruption has left many leaders feeling like they’re meandering through a haunted house, lost in the darkness, without a way to clearly see what’s around the next corner. Fearful of the next big scare, they make poor decisions, none at all, or worse—they try to turn back, hoping to recreate the world as it was decades ago. As futurists, our job is to flip the switch, turn on the lights and illuminate the path forward. Once leaders are able to see and hear what’s up ahead—all of the trap doors, hidden rooms, masks and costumes—that haunted house is transformed into a regular old building that can be navigated without fear or concern. With the lights on, we embolden leaders to realize their own preferred futures. Amy Webb is a quantitative futurist. She is a professor of strategic foresight at the NYU Stern School of Business and the Founder of the Future Today Institute. She was named to the Thinkers50 Radar list of the 30 management thinkers most likely to shape the future of how organizations are managed and led and was shortlisted for a 2017 Thinkers50 RADAR Award. 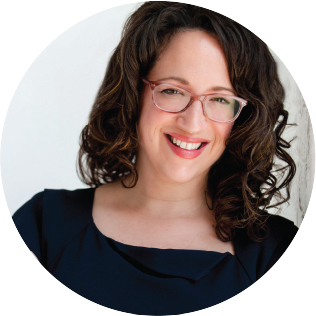 She is the Washington Post bestselling author of The Signals Are Talking: Why Today's Fringe Is Tomorrow's Mainstream. 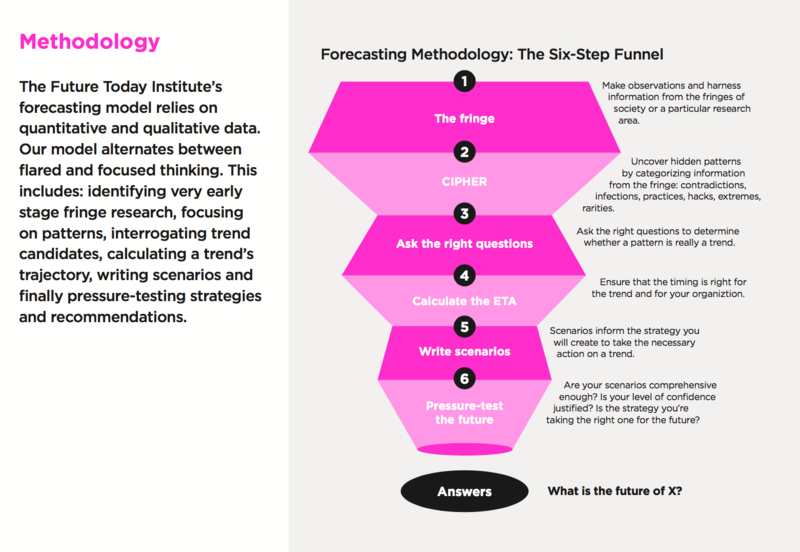 Our futures forecasting methodology relies on quantitative and qualitative data, and it has six steps. First we identify what we call “unusual suspects” at the fringe. From there, we uncover hidden patterns, connecting experimentation at the fringe to our fundamental human needs and desires. The patterns reveal to us a possible trend, one we’ll then need to investigate, interrogate, and prove. Next, we calculate the trend’s ETA and direction: Where is it heading, how quickly, and with what momentum? However, identifying a trend isn’t enough. We must then develop probable, plausible, and possible scenarios in order to create a salient strategy for our clients and partners in the present. There is one final step: pressure-testing the strategy against the trend to make sure any planned actions are the right ones. The Institute’s forecasting model’s six steps require us to alternate between hyper-creative “flaring” (thinking very broadly), and focusing down to very practical, tangible implications. If you look closely, you’ll see that it’s a curvy funnel—flaring and focusing as we move along from steps one to six. Our forecasting model and methodology is explained in detail in The Signals Are Talking: Why Today’s Fringe Is Tomorrow’s Mainstream, the new book by FTI’s Founder Amy Webb. It was also featured in the Harvard Business Review and the MIT Sloan Management Review. Our logo was developed by Emily Caufield, the Institute’s Creative Director, and her idea was to communicate two core concepts: who we are and the mission of the Institute. Inside the box are a set of circles and rectangles, which might seem interchangeable at first. However, if you look closely starting from the left, you’ll see the letters F T I. Together, those letters form an ideogram representing the notion that the future is very much intertwined with what we are all doing today. You may be wondering what, exactly, a futurist is. Don’t worry—you’re not alone. The term “futurology” comes from the Latin (futurum, or fu-ture) and the Greek suffix -logia (the science of), and it was coined by a German professor named Ossip Flechtheim in 1943, who, along with author H. G. Wells several decades earlier, proposed “futurism” as a new academic discipline. It’s an interdisciplinary field combining mathematics, physics, philosophy, strategy, technology, economics, design, history, geography, biology, theology and anthropology. Throughout the past century, many noted futurists have contributed significant work to the field. FTI’s methodology, strategic thinking frameworks and tools have been influenced by earlier futurists, including Yujiro Hayashi, Robert Jungk, Olaf Helmer, Bertrand de Jouvenel, Arthur Clark and Alvin Toffler. As futurists, we don’t make predictions. Our job is not to spread prophecies, but rather to collect data, identify emerging trends, develop strategies, and calculate the probabilities of various scenarios occurring in the future. Our forecasts are used to help leaders, teams, and individuals make better, more informed decisions, even as their organizations face great disruption. This is the first time in human history when real, fundamental change is taking place within a single generation, and the driving force is technology. Technology is no longer the domain of science and industry alone; it is now inextricably linked to who we are and everything we do. The established silos of communications, business, education, media, government, politics, defense, public health, the arts and activism are morphing into a loopy, interconnected Venn diagram. Seeing the future is possible, even though the rate of technological advancement has begun to outpace the speed at which many organizations are accustomed to functioning. We must focus on interconnected relationships between one or more technologies and a system, rather than becoming fixated on a single, promising new gadget, app or startup. We must begin asking ourselves what are the implications of our actions? What will technology mean for our organizations? For society? If we fail to plan in advance (or if we rush in with the wrong strategy) what outcomes will we face?….. as often as we ask what can we do to build the next generation of tools and products? We at the Institute look forward to helping you navigate the challenging road ahead. Technology will further complicate and disrupt organizations everywhere. Without the right action, an organization might find itself left behind, making catastrophic decisions, or shuttered entirely. Our promise, and the mission of the FTI, is to help leaders make better, more informed decisions, ensuring the vitality of an organization’s future, today.